David Griffiths worked as a miner in Ystradgynlais before joining the Royal Garrison Artillery on the Western Front. He was killed in action at Arras in September 1918. A big thank you to Alan Griffiths for the photographs of David Griffiths, including photograph of the cross on his grave. The information on David Griffiths has been compiled from a number of sources, including the Commonwealth War Graves Commission, from the Labour Voice newspaper, and the Parish Burial Register (courtesy of the Swansea Archives). 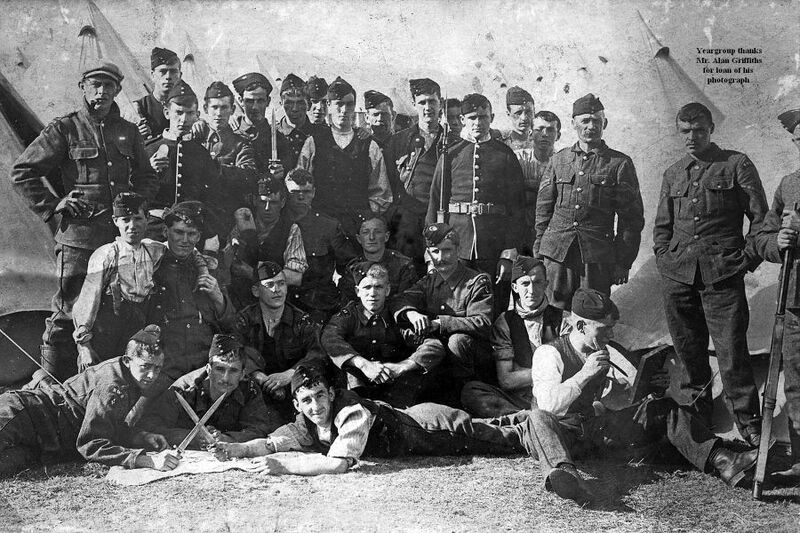 Unit and Regiment Royal Garrison Artillery; 194th Siege Bty. Additional Information Address: Cwmgiedd Ystradgynlais. Born in Ystradgynlais. Former Coal Miner (hewer). Cemetery QUEANT ROAD CEMETERY, BUISSY – FRANCE; VII. H. 12. Remembrance Grave Yorath Chapelyard, Cwmgiedd, Ystradgynlais. Grave inscription: Their son who fell in action at Arras France. Aged 31 years. Family Details Son of David Thomas (born Ystradgynlais 1850 died 30th May 1930) and Sarah Griffiths (born Ystradgynlais 1855 died 17th Sep 1906) The family lived at 7 Chapel Street, Ystradgynlais. Corporal David Griffiths R G A has been awarded the Military Medal for conspicuous gallantry during the recent operations in France. He is the son of Mr D T Griffiths of Cwmgiedd Ystradgynlais, one of the oldest inhabitants of the place. 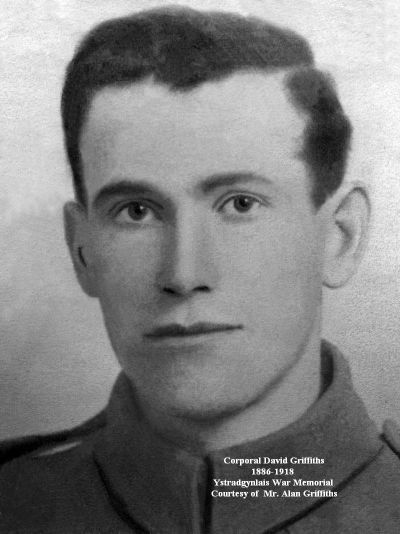 Corporal Griffiths, who is 30 years of age, has seen considerable service in France, having been “out there” for 20 months. Before the outbreak of war he was employed in Yniscedwyn Colliery Ystradgynlais, as a miner. Corporal Griffiths is the first native of the district to win such a distinction. 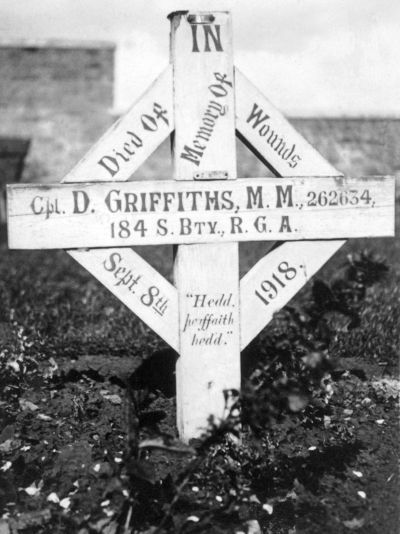 Intimation was received at Cwmgiedd that Corporal David Griffiths, M. M. of the R. G. A., son of Mr. D. T. Griffiths, had been mortally wounded on the 8th inst. His officer states in a letter that Griffiths received a severe shell wound and despite prompt attention, he died 10 minutes after being removed to a dressing station. He was the first and only military medallist of the place and his death is mourned by a very large circle of friends. 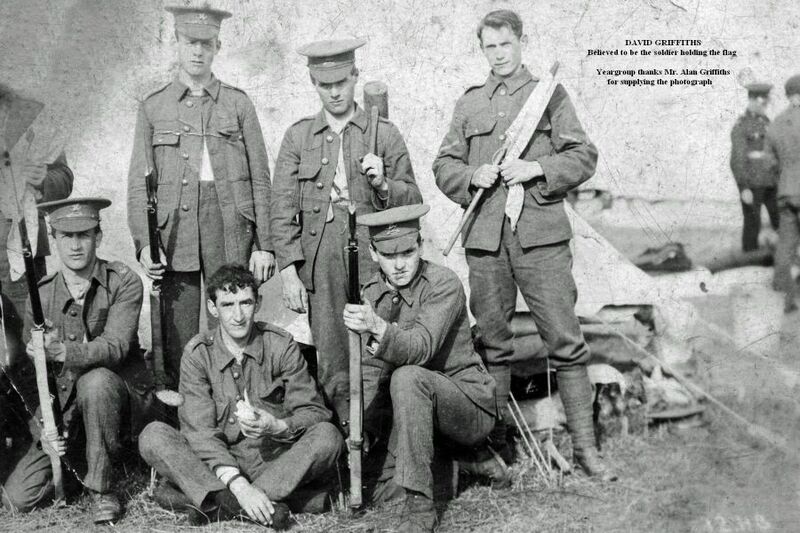 Thank you to family member Alan Griffiths for the following photographs, showing Corporal David Griffiths with the army, and the cross on the grave. The cross marking the grave of Corporal Griffiths. His service number is incorrectly written on the cross as 262634, instead of 262834. 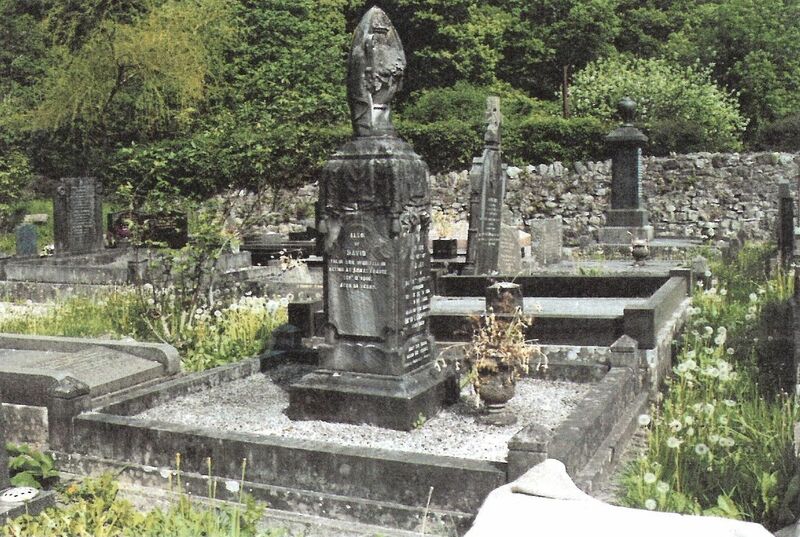 Cwmgiedd, whose good name was somewhat compromised during one period of the war because of its supposed "neutrality," will probably take the lead in the valley of erecting a war memorial. The suggested memorial will take the form of a stone, suitably inscribed, a replica of the wooden cross erected over the grave of Dd. Griffiths who lies buried in Flanders. 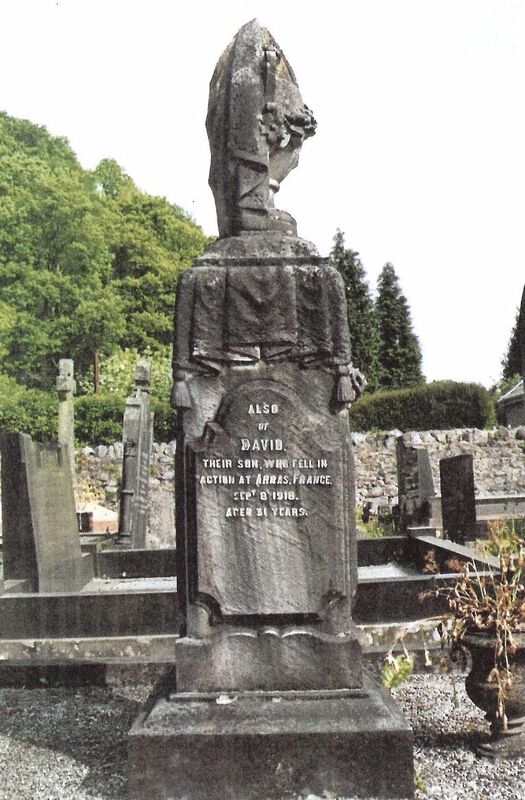 Private Griffiths was the only Cwmgiedd man to make the supreme sacrifice, and the memorial will be erected over the family grave in the Cwmgiedd burial ground.